I should eat a huge breakfast, but I always feel slightly nauseous, excitement, nerves, goodness knows, but hunger is not realised until hours later when I arrive at the Meet A lot to be done before then. Everything is prepared the night before, routine is essential to the next few hours to ensure nothing is forgotten. The rest of the family are packed off to school and work and the horse is loaded. We head off with a quick glance at the parking instructions. These are never simple, even with Jane William's wonderful maps and added notes. Pinpointing a field in the middle of nowhere is not something I usually achieve at the first attempt. It is always a pleasure to see Andrew and Danny’s lorry up ahead and tuck in behind them. Instructions are to enter the field keeping left, turn at the end and park on the left, avoiding the right at all costs as very boggy. Oh dear, David Radcliffe seems to have got his left and right muddled and is now embedded in the bog. Others are helping him so I go on to the Meet. I am constantly overwhelmed by the generosity of people hosting Meets, whether it be in a field, a farmyard or on a smart gravel drive. We are made to feel so welcome with a glass of port pressed into our hand and a warm, crisp sausage roll. Few things can taste better at 11 o’clock in the morning. Out of the corner of my eye I am relieved to see David arriving. The relief is short lived, he is approached by our host with a tray of port, his horse takes fright and port, glasses and tray are sent flying. That man should not have got out of bed this morning. The chatting and drinking are brought to an end by the Master who says a few words. These are often lost into a howling wind, the roar of an aeroplane or a Field that keeps chatting. Then we are off, a perfect moment as the Huntsman blows his horn, someone shouts “Hounds Please!” and we move aside to let them pass and then fall in behind them. 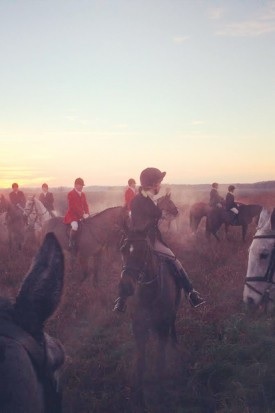 The Surrey Union Hunt off to do what it does best. The day unfolds before us. The first covert a rather serious affair, everyone concentrating, horses alert, their ears pricked, the hounds working their way through the undergrowth. They draw a blank and we move on. At the next covert the hounds seem to disappear entirely and we are left standing in a small clearing. The warmth from the food and drink at the Meet beginning to wear off, hip flasks are produced. Colin Marsh tells one of his very bad jokes and hands around a flask full of “Dorking water.” Spirits revive. Everyone is hoping to have a taste of Geraldine Firth’s raspberry vodka, homemade and delicious. When Hunting is under threat, Geraldine can be found making sloe gin to fill her hunting flask in the years to come, a most determined lady. Tom Zamoyski brings out some of Colonel Girling’s Mixture. Goodness knows what is in it, but it slips down well. Freddie Ford is seen dismounting. He is not an advocate of “going” behind a bush, but after his rather public display he leaps easily back into the saddle thanks to a rather splendid elongated stirrup leather made for him by Ellie Martin. Hounds return looking a bit breathless and pleased with themselves and we move off again. Not far this time before a wonderful cry starts up from the hounds and they stream across the field in front of us. What better sight in the world. We urge our horses on to follow. Lynne Norton passes me, she has borrowed Fraser’s lovely grey again and the look of exhilaration on her face exactly matches my own. We were both experiencing that amazing feeling of being totally at one with your horse. Not, in my case, for long. We come to a hedge, a small, perfectly formed hedge and we sail over it. There is another ahead, those in front push on. Graham Rand, Freddie Ford, Mark Sprake and Rebecca Harvie surge forward, taking off well back from the hedge and sailing over. Alarm bells should have rung but they did not, nothing seemed amiss. We started to “climb” the hedge and saw as we did so the large drop and ditch on the other side. We came crashing down. “You have got to push on” yelled all the earlier thrusters. Thanks, I thought, as Ellie Martin and Clare Rickard sailed elegantly overhead and a flash of yellow further down was Michael Loates Taylor (affectionately known as “Marigold” because of his rather vivid riding gloves) clearing it with ease. Several others joined me in the mud but no harm was done and a mental note was made never to do it again. Hounds were running and we kept with them. We leapt over ditches, pushed through bramble patches and staggered out of deep mud over the tiger traps. Rachel Brooker is of the view that had tiger traps been called “little friendly triangles” none of us would be scared of them. I am not convinced. We were brought up short by a deep gully ahead full of very murky water. There was a crossing point, but the ground on either side was muddy and heavy. The first few went through, “keep left,” came the cry. Some did and some did not. Horses floundered and those that saw the way out ahead and went for it sank beneath the water, their riders floating off their backs. Richard Grassley came unstuck, Geraldine emerged on the far bank without her horse and dripping wet and a small child on a small pony never had a chance. I followed them in, it was impossible to stay on your horse if it took the middle route as mine did, we were both up to our necks in the water. Not easy to get out and very difficult to get back on with everything wet and slippery. Danny Davies kindly held my legs up one after the other so that all the water could run out of my boots. Hip flasks reappeared and a lot of rude comments were made, then we set off to find hounds. Once we got moving the wetsuit effect started and I felt wonderfully warm. It was only when we stopped on finding that the fox had gone to ground that the cold really set in. People began to drift home. Judeth Chamberlin and Ann Metson were leaving, both with livery yards to run and a lot to do before their day ended. I am in awe of how much they and others do before and after a day’s hunting. I head back with them, Nicky Selby joins us. Nicky had not got wet but she is covered in mud from top to toe. She and I will meet at a Parents’ Evening later, well scrubbed and very far removed from our day’s experiences. Horses are loaded, the rain is setting in, I am starting to shiver and my neck is beginning to hurt from my earlier fall. I will definitely be late collecting the children and I have just remembered that I have nothing for supper, but a happier person would be hard to find. There is another hour of daylight left and as I drive away I think I can hear the faint sound of Ian Shakespeare blowing his horn. Mrs Meller will still be hunting and enjoying the end of the day with no noisy Field to concern her. “I’m the opposite of Penny – can just about sit on a horse the right way round but still love a day out hunting. We’re sure Gill underrates her abilities in the saddle but it goes to show that even the less experienced can succumb to the magic of a day’s hunting. Some years ago, in my mid thirties,I decided a friend and I needed a bit of excitement in our lives. Regular riders who loved a gallop (although we didn’t have our own horses), I thought it would be fun to try hunting. My friend, a more competent rider - not difficult - instantly agreed. I was tasked with sorting out logistics. I was so nervous the night before, worried I was going to die, be horribly injured, be a laughing stock, etc that I couldn’t sleep. Bleary eyed, we turned up at Eashing and quaking with nerves, were introduced to our mounts. Our hirelings were total pros – they stood quietly as we downed as much stirrup cup as possible to quell our nerves. Off we set, it was a beautiful day, cold but bright. There was a huge field out and the mist created by the heat from the horses was other worldly. Being part of such a longstanding tradition was an honour. We had a fabulous day, great riding; beautiful scenery, met lots of lovely, friendly, welcoming people and laughed a lot. We were on-board around five hours (very hot baths were needed when we got back). I can honestly say it was one of the most exhilarating days of my life. Not soon after that, we hired from Polly again and had another great day. It’s the thrill of clearing a 5ft hedge without thinking twice (just kick on, find a nice-looking gap and pray, is my technique). ‘How brave,’ people say, looking at the photographs. ‘I could never do that.’ Well, I never thought I could, either. There may be photographic proof, but my memory has erased the details of the whole fearsome jump, a bit like it used to do with those shocking exam papers I knew I had failed. It’s about jumping our way across David Cameron’s constituency; discovering D-day training sites scattered with replicas of Normandy’s Atlantic Wall, and the true location of James Bond’s Skyfall (sadly, in the film it’s Surrey rather than a remote Highland glen). Those are the little things that make a day perfect.